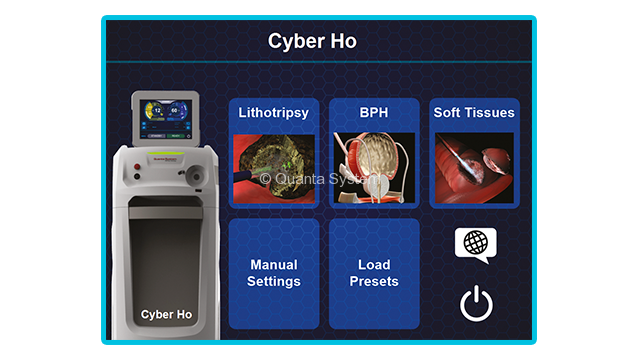 Cyber Ho Holmium (2.1 μm) laser devices meet the increasing demand for efficacy and flexibility, with a unique multi-application laser platform able to perform both Lithotripsy and HoLEP. Cyber Ho is available in two versions (medium and high power) that can reach up to 105 W power, represent outstanding innovation by offering the exclusive Vapor TunnelTM and MasterPULSETM technologies for advanced retropulsion control. This device also offers impressive settings regarding power, energy and frequency. 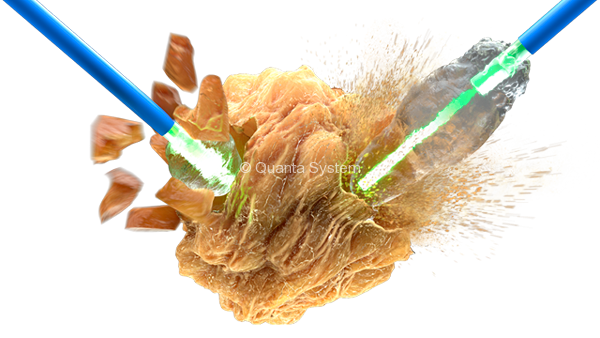 Specific laser pulse modulation generates longer bubbles able to extend further, creating a connection channel with stone target, granting enhanced energy delivery and thus effective and fast ablation of it. As the bubble has touched the stone, retropulsion is limited. Cyber Ho laser device offers impressive settings for superior surgical experience, offering high power (up to 105W), high repetition rate (up to 80Hz), pulse energy (up to 5J) and high versatility at the same time in pulse width adjustment . Endless settings combinations enable more treatments available and greater versatility in techniques. 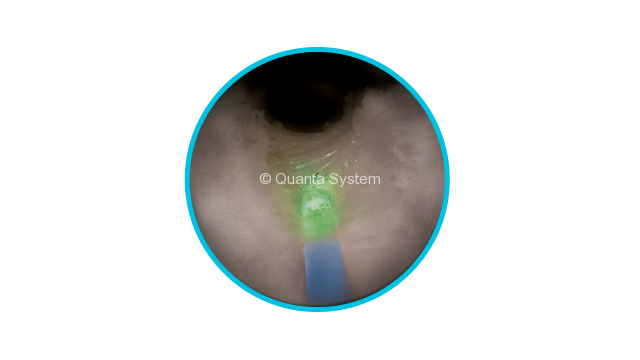 HoLEP (Holmium Laser Enucleation of the Prostate) is a proven technique for the treatment of BPH, with high effectiveness, safety and durability. Cyber Ho devices offers full choice regarding settings selection, with superior surgical experience granted by the double footswitch, the high emission power (up to 105W), the intuitive and large modulation of pulse width and the dedicated modes for the different steps of the treatment. The multiple combinations of settings and tools allow the maximum versatility of use, so that the surgeon can easily reach the desired results. Reducing retropulsion and modifying tissue cutting gets easier: instead of trying multiple different settings, start with your preferred ones and then adjust the MasterPULSETM to tune the effect of laser emission based on your visual feedback. Experience a more intuitive and faster adjustment of laser settings thanks to the 7 pulse width levels (compared to the traditional 3 steps of the other holmium laser). 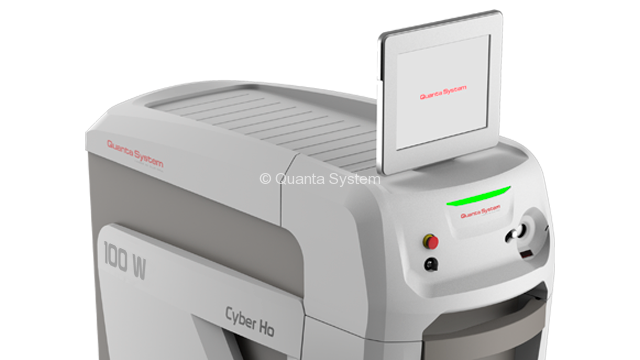 Cyber Ho represents a truly complete solution for stone treatment offering any tool needed. 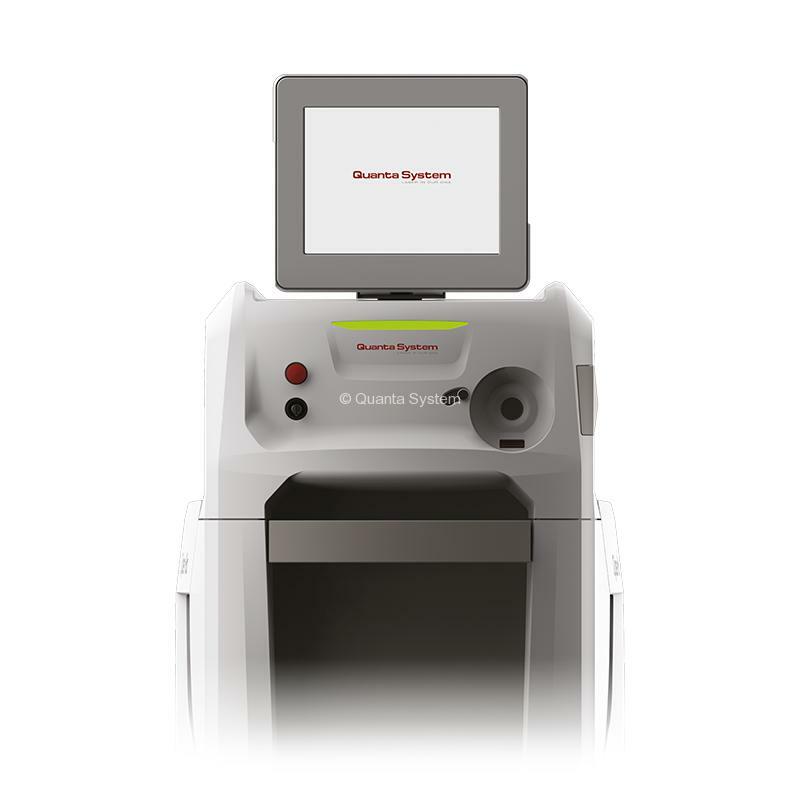 The user can choose among multiple techniques, including high frequency lithotripsy, dusting, fragmentation and popcorning, overcoming stone retropulsion by advanced tools such as MasterPULSETM technology. 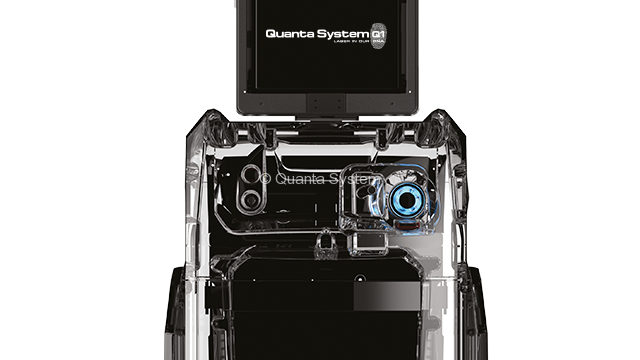 Quanta System knows how often inexperienced surgeons are in need of advice regarding settings and therefore understands the importance of having user-friendly laser devices. For this reason, we introduced a guided modality to automatically select proper settings based on the intended treatments. 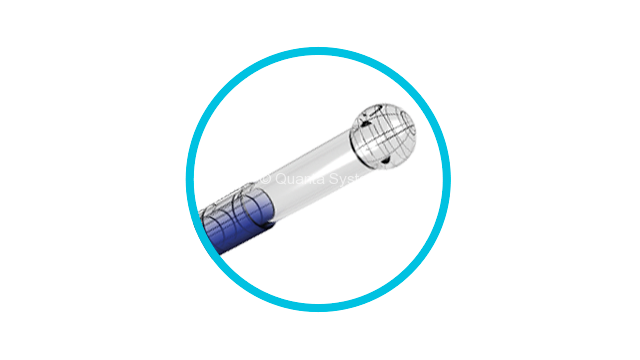 With this enhancement in user experience, we want to offer you the best laser solutions regardless of your experience with Holmium laser. 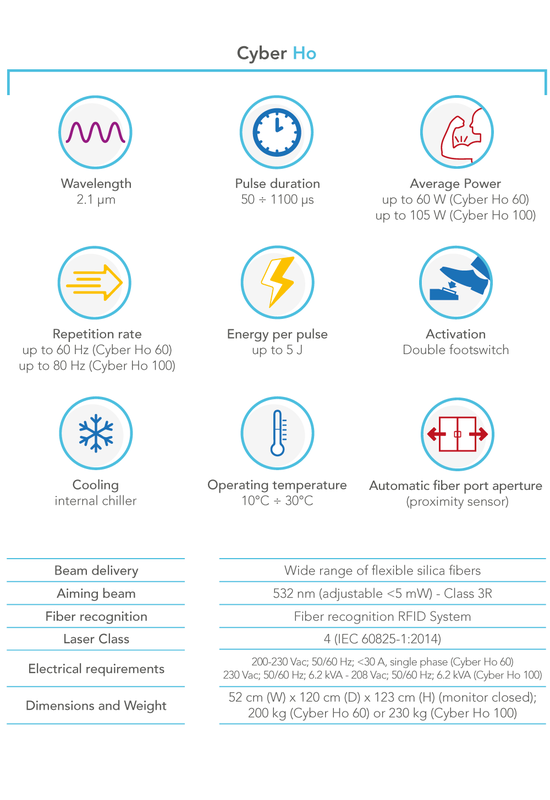 Cyber Ho device is designed for extreme performance already with small standard fibers (allowing more than 30W even with the smallest fiber diameters). Thanks to this feature, the user shall not refrain from having fiber flexibility and high emission power at the same time. 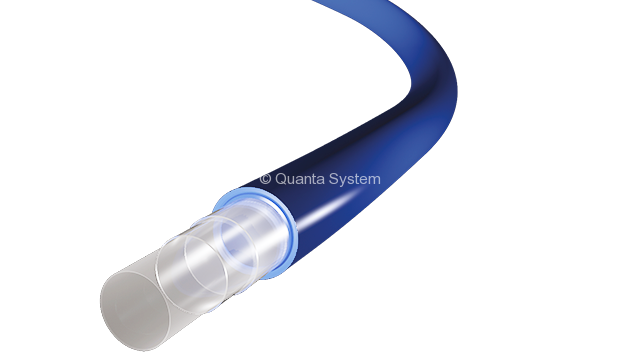 The use of these fibers strongly simplifies the phase of fiber insertion in already bent scopes, preventing the damage to the ureteroscope working channel and aiding the sliding of fiber tip inside of it. These fibers are available for a single use only.